We took mountain bikes only, because I didn't have a choice. Peter mountain bikes exclusively, and Peter was driving, so his word was law. It was the rational choice as it avoided the likely hordes of drunk drivers. 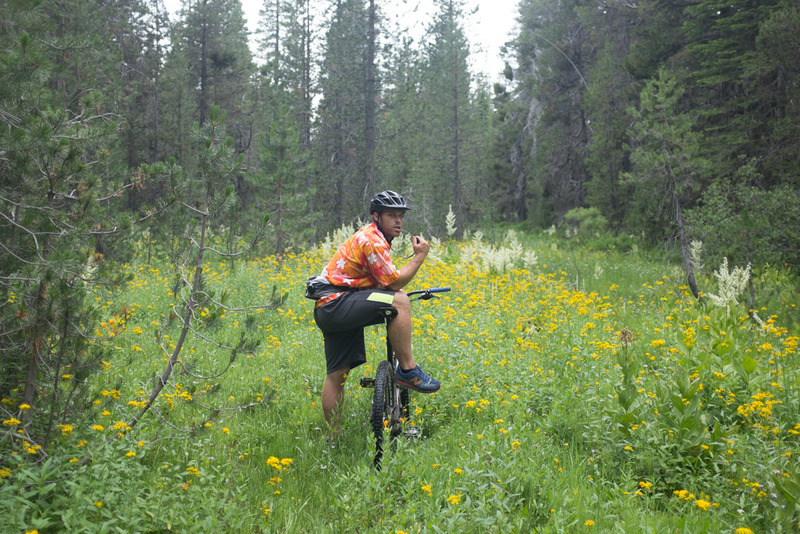 Plus, mountain bikes are vehicles that can take you where no skinny tire can, and that sort of exploration into wilderness bliss harkens back to Manifest Destiny itself, one of the purest forms of Liberty Americana. As previous stories have recalled, I'm on a journey to ride more dirt, and to enjoy it more. Three days of mountain biking with no other options worked great to that end. Day one was purely exploratory. Poor trails, rolling through meadows, gravel roads, guided only by the intuition that we could do whatever we wanted. That night the fourth of July rounded out the rest of the Bs, with beer and barbeque in perfect excess under a mountain sky of stars and fireworks, equally brilliant. The fresh air called our names the next morning as we headed down Sterling's Canyon to Point Mariah, stumbling upon some glorious singletrack. Mountain biking had never felt so good. I was comfortable, but mostly, awed by where thick tires and suspension got me so easily. We finished at the lake, refreshing with cold mountain water and fresh beer, lazily floating away the rest of the day until the next barbeque. Our last day was an important reminder that the journey towards dirt nirvana is far from over. We rode Hole in the Ground, a beloved local trail on Donner Summit, known to be both beautiful and technical. We started climbed to Andecite peak, quickly hitting glorious single track that led to stunning views of Castle Peak. We hit the ridge, which descended but was well maintained and graded. But from there, things went downhill, but in elevation and attitude. We were soon on the most rocky, loose, technical trail I'd ever ridden. I rallied for a while, but let the fear get the best of me eventually. It sucked to have my morale so low, giving up when I shouldn't have and being over it. Luckily, good friends and sandwiches prevailed, and I made it without incident, mentally or physically. In the past I think I would have kicked and screamed, maybe thrown my bike for good measure. But I accepted that I was learning, and was well supported. A little level two fun never hurt, and I know I'll there where I can trust myself and the bike to get a little rowdier. But for now, even a poor effort on the tough trail left me with great memories and splendid views and a ton of fun. I'm hooked on what mountain and cross riding can bring me and stoked to improve, thus, the dirt chronicles continue.